The outstanding work of the Brigham research community is what drives us forward towards our goal of a healthier world through scientific discovery. Being a part of the BRI leadership has given me broader exposure to our passionate and talented research community; I have been both inspired by what I’ve seen and honored to continue to serve in this capacity. All of the work here at BWH deserves to be recognized; I started publishing this newsletter to celebrate the work of researchers and the BRI when I was the BRI Director and am continuing Petri Dishes in my enthusiasm to stay involved as the immediate past-director. Looking back at my two years as BRI Director, I am proud to have been able to distribute >$4,000,000 to the BWH research community through various channels (see below). Here’s wishing you continued success in 2019! Have You Seen Our New Research Campaign? Brigham Health is a research powerhouse. January marked the beginning of our new Brigham Health “Did You Know?” research awareness campaign. The campaign lives on the rotating flat screens throughout the hospital and features historical milestones and breakthroughs as well as current accolades involving the Brigham Health research community. Discovery and innovation are a key strategic focus of our institution and the goal of this series is to highlight our discoveries and innovative work. Relevant facts, figures and honors may be submitted to bwhbri@partners.org for consideration for inclusion in the campaign. These semi-annual luncheons provide opportunities for investigators from across BWH departments to meet with the BRI Executive Committee and hospital leadership to provide feedback directly. They were launched in 2015 with Professor lunches and then expanded to all ranks in 2017. Take a look at the numbers below indicating the strong and consistent attendance at these ongoing events! You can also sign up for upcoming lunches based on your rank here. The Bridge Fund to Sustain Research Excellence (FSRE) began in 2008 and, since then, there have been three cycles per year during the months of April, August and December. In total, 209 PIs have applied for this funding and 126 PIs (60% of the applicants) were awarded a total of $8,268,122.54. Congratulations to the five PIs who were each funded $57,000 in December of 2018, the 31st cycle of the FSRE. The next deadline is April 1st, 2019. Click here to learn more and apply! Heard about the Hypoxia Symposium? 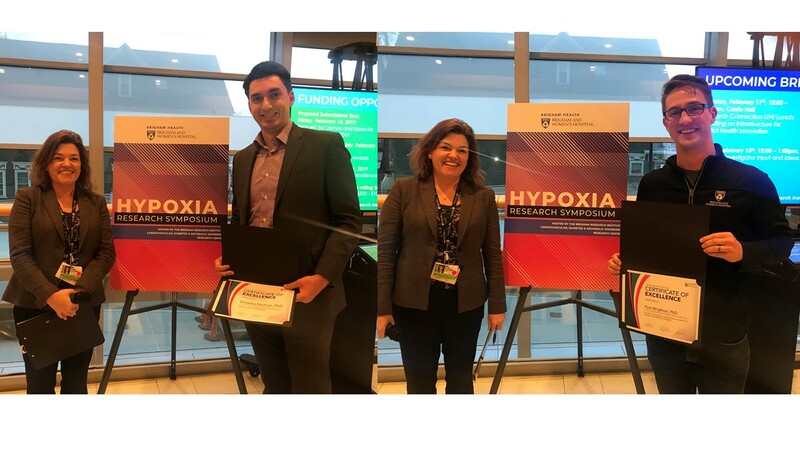 Poster Winners are pictured in the bottom two photos, receiving their certificates and $250 award from Marie McDonnell, MD. From the left, Paul Wrighton, PhD and Gregory Ekchian, PhD. BWH Paper of the Month! “I like to think of it as hitchhiking. Cancer cells have a built-in system to produce and recognize microRNAs and we’re getting them to ‘pick up’ our sequence—which encodes multiple microRNAs—and start making more copies of them. The cellular machinery is running, and our sequence is along for the ride,” says Pierpaolo Peruzzi, MD, PhD, attending clinical neurosurgeon, Department of Neurosurgery, PI in the Harvey Cushing Neuro-Oncology Laboratories at the Brigham. Check out the full article and find the publication in Nature Communications here. This new program will support the careers of Assistant/Associate Professors at the hospital who have made outstanding contributions to their chosen field of research and who have exceptional potential. Through an annual competitive process, up to three investigators will receive President’s Scholar Awards in the amount of $100,000 per year for three years. Department chairs may nominate up to three candidates for this award – nominations of women and underrepresented minorities in life sciences research are encouraged. The deadline for nominations by Department Chairs is Feb 15th, 2019; click here to learn more. Want to Showcase Your Research at Discover Brigham Next Year? 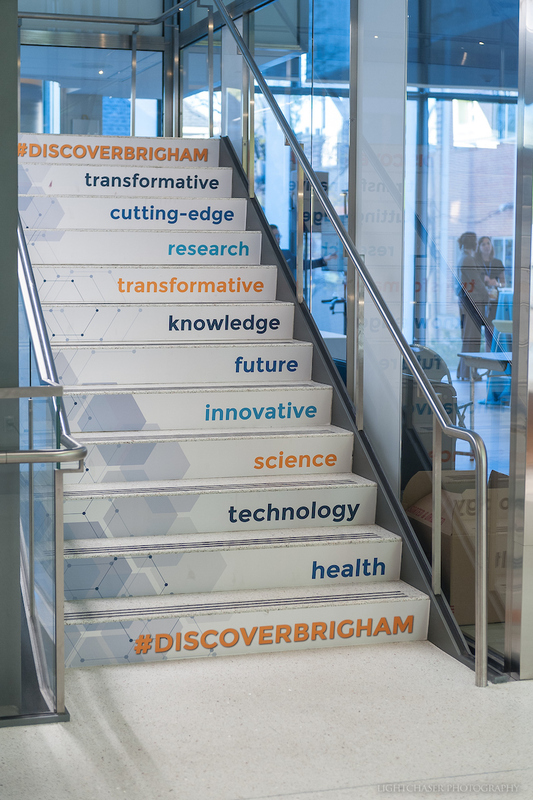 Inspired to participate in Discover Brigham after this year’s event took place? Now is your chance! Click here to view the Open Call for Sessions, Demos or Ideas for Discover Brigham 2019! BWH researchers, clinicians and staff are invited to submit ideas for sessions focused on research and/or clinical innovation topics and/or demos at this annual research showcase or, if you have an idea about how we should celebrate and elevate research at BWH, submit that as well. Come up with your best idea(s) for session, demos or even the whole event and the BRI will provide the logistical support necessary to execute your vision for Discover Brigham! Submissions are due February 15th, 2019. Click hereto view the information for this exciting opportunity!